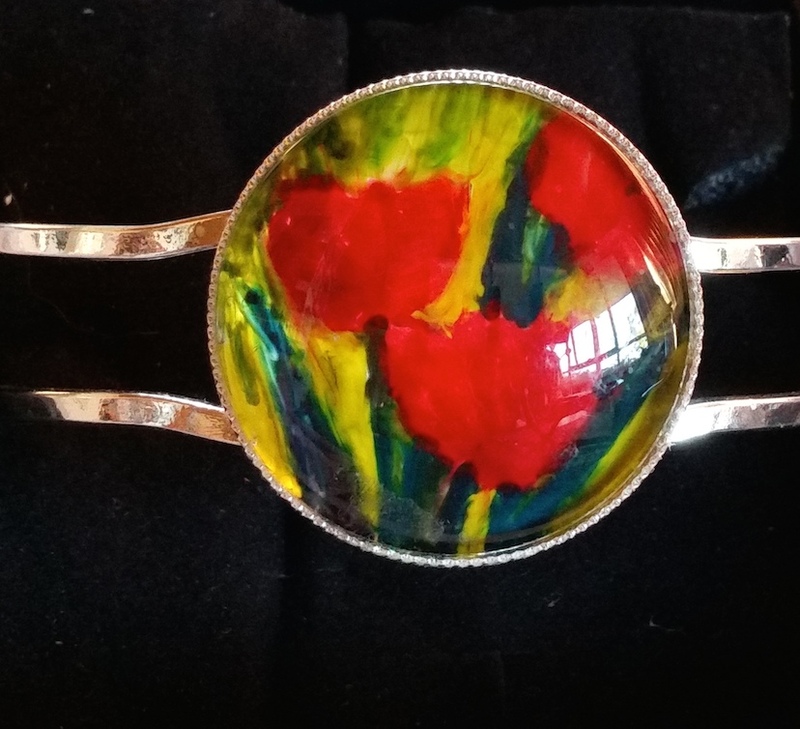 Encaustic painting in jewellery settings. I have too many paintings for the walls and I have always enjoyed “small” so increasingly I am doing tiny works to put into jewellery settings. Many are silk paintings but I have also been exploring my own unique way of painting with pigmented wax,encaustic paintings, as wearable art. Encaustic paintings are beautifully vivid and under the glass cabochon the 3-dimensionality is accentuated. These are selling so well locally and to cruise ship visitors that I am finding it difficult to keep up with demand. Many, like the set, are based on flowers in my garden but some are abstract ocassionally suggesting a scene.No two can be the same as it is not possible to get that degree of control with the way I work. But that is how I like it … each unique item to be paired with a unique wearer. Today I bought a mini tripod and remote shutter for my mobile phone so I can take photos of my work quickly and without any camera shake. All I need now is to make up a tent to get rid of the reflection of the studio windows. 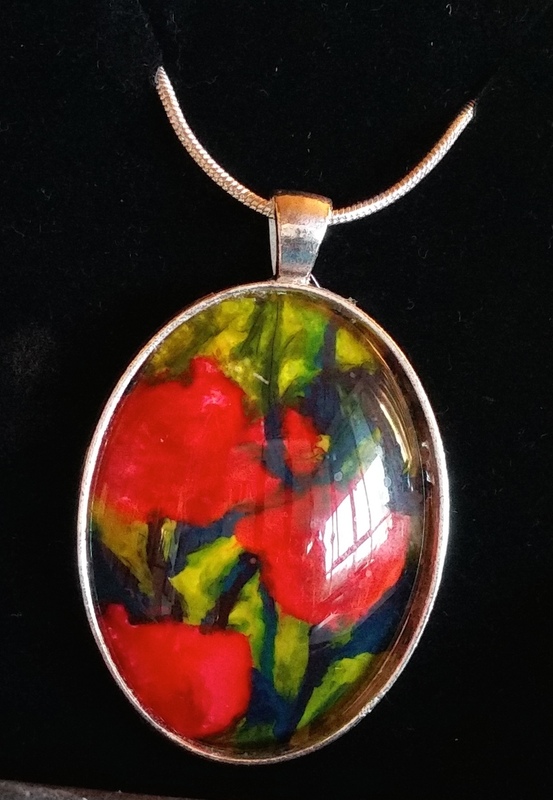 Encaustic art pendant. Original painting. “Red Tulips”. Silver setting. Sterling silver snake chain. Oval. 50x30mm. Clear glass cabochon. 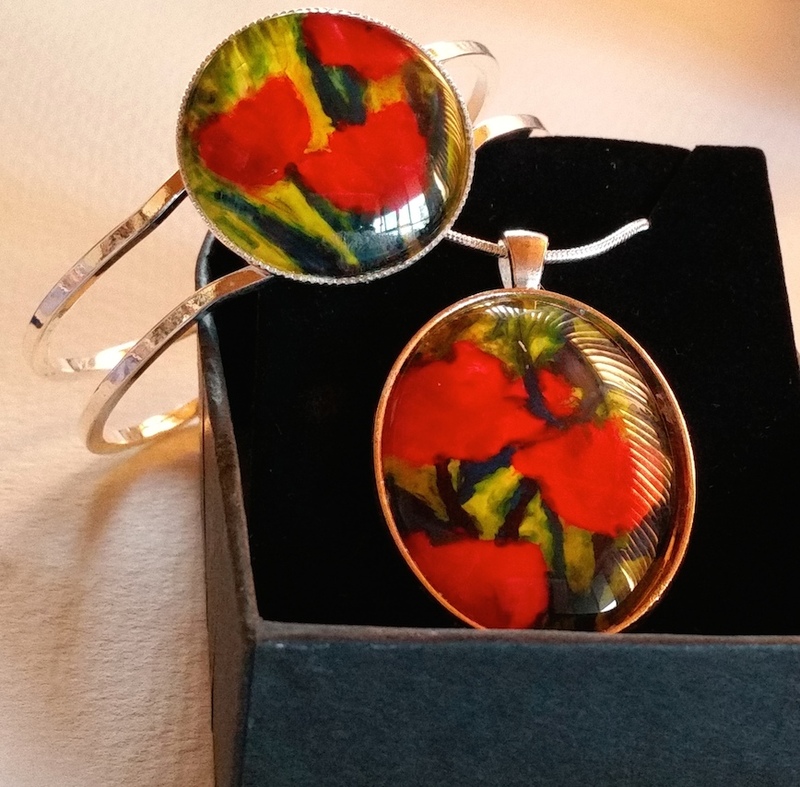 Red Tulip pendant and bangle set. Original paintings. Encaustic art as wearable art. Hinge opening bracelet. Fit up to 20cm wrist. Original encaustic painting in silver setting with clear glass dome cabochon protecting art work. These will be availabble on my handmade shop at a later date. This entry was posted in encaustic, flowers, painting, Tasmanian artists and tagged colour, encaustic art, floral, handmade, unique jewellery, wearable art.